It is possible to talk about overcoming injustice without reverting to anger and divisiveness. Come out and be a part of this event as we have a discussion about the significance of Adwa, Haiti and how people around the world can stand for justice through unity and overcome tyranny through togetherness. You are cordially invited to Kaldi’s Social House as we discuss the history and significance of two watershed events that showed oppressed people globally that tyranny has a shelf life of zero when a people are united as one. 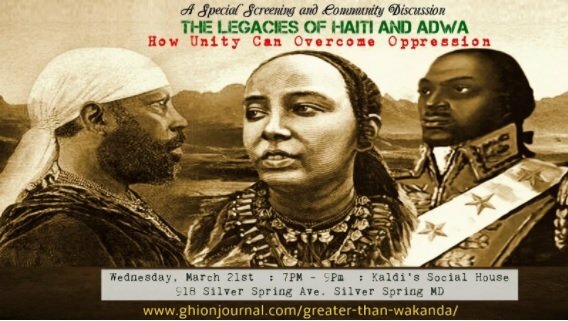 This event was inspired by one of the most widely read articles here at the Ghion Journal titled “Greater than Wakanda”. A video will be shown about the Battle of Adwa and the insurrection of Haiti. There will also be a cultural show incorporated as well as a discussion about how we can unite in our present moment to work towards justice.